Viking Age woman wore an ankle length linen under-dress or shift, with the neck closed by a brooch. Over it, she wore a shorter length woolen dress suspended by shoulder straps fastened by brooches. This kind of suspended dress is sometimes called a hangerock or an apron-skirt. The rear straps of the suspended dress were long enough to pass over the shoulder to the brooches, while the front straps were much shorter, as seen in the photograph to the left. A pin and catch on the inside of the brooch held the loops of the straps to the brooch. In modern times, these brooches are sometimes called turtle brooches, since their shape is similar to the shell of a turtle. A number of different kinds of head-coverings for women are mentioned in the sagas, some of which are elaborate headdresses, which may have been worn like jewellery on special occasions. It has been suggested that the type of headdress worn served to distinguish married from unmarried women. Kona is the Old Norse word for "wife" - today also called Frau, after the goddess Freyja - also called Husfrau - or House Freyja meaning Lady of the House as opposed to Huskona who did not hold as high a status as the former being a woman of social standing and substance. Viking Age weddings were celebrated with an elaborate feast often lasting a month or more. Viking wedding guests enjoyed eating huge portions of food at these feasts and drunkenness was the norm but not usually all done in a day as in modern times? They were also filled with music and story telling. The guests were seated on benches and the bride was seated separately from the groom. The Saga of Egil and Asmund tells us that this allowed the older, more experienced ladies to give them advice about how they should conduct themselves. The written text and the archaeological evidence on how weddings were performed by our honoured Germanic heathen folk remains sketchy even so much less the fragmented heathen traditions surrounding the Anglo-Saxon tribes of England today. Vikings did however inter-marry with the English, another point we should bear to remember. Is it just possible then that by borrowing elements from the Icelandic Sagas, and incorporating heathen elements both oral and historical, a Viking Age wedding ceremony may just be possible to reconstruct such a ceremony? For our honoured Viking ancestors, the date of the wedding would have been certainly limited by the climate. For example travel for the wedding guests assuming the bride or grooms family came from far and wide rather than in close proximity which was unlikely would have been impossible during the harsh winter months. The wedding actual would have been a week long affair which hasten the need for plentiful food and honey ale making the wedding most likely around the harvest time of the year. Part of the legal stricture regarding the wedding would have been the consumption by both the bride and groom of the bridal ale which meant usually mead. The confusion arises when we have a play on words regarding the honey moon suggesting one lunar cycle of approximate 28 days. But accounts suggest that there must be enough of this ale so that the couple could share it for the preceding month to come. Friday would have been the date chosen for Viking weddings in honour of the Nordic goddess Frigga. The earliest weddings were very different from our ideas of what marriage is today. Germanic girls of the Late Iron Age were married between the ages of 12-16. The girls had no say in the marriage and they were then expected to run a household. Current anthropologists suggest that our primitive ancestors came together as a collective in the main for protection and survival rather than for meaningful romantic love or hormonal based relationships. The Vikings did not practice courtship, where a man and a woman could evaluate their compatibility, or in which love could blossom. Marriage amongst the ancient heathens was meant to provide a financially stable environment in which children could be raised and a contract or bargain between two families. 1) Jochens, Jenny M. Women in Old Norse Society. Ithaca: Cornell Univ. Press. 1995. Quite to the contrary, she was considered still a part of her former greater family. She was given responsibilities and trust, and even the right to divorce her husband if he mistreated her or was adulterous. To do so she called some witnesses and made them aware of her intention to divorce. In front of these witnesses she declared herself divorced from her husband at the front door, and then at their bedside, declared her divorced from her husband once more. In Iceland, she would have had to also declare her intentions and reasons for divorce before a public assembly such as the Thing. This sealed the divorce. 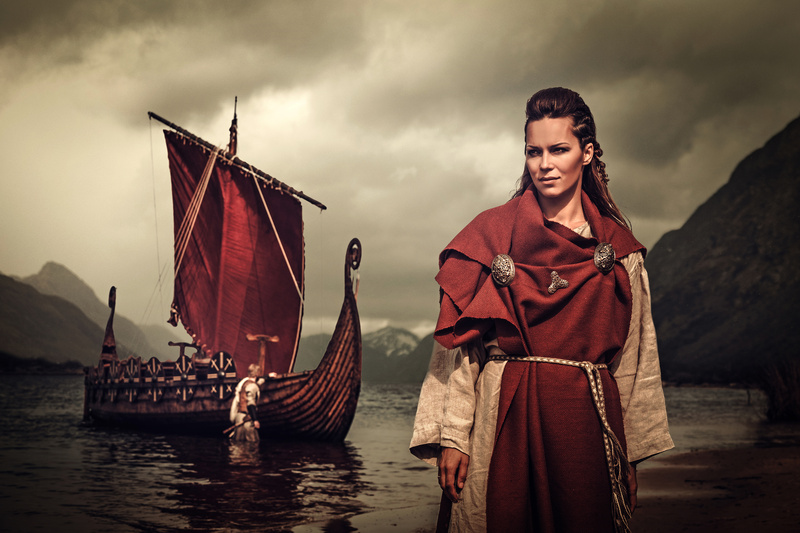 Viking woman had more rights than any other woman in Europe at the time. Everything a woman brought into a Viking marriage was hers, and did not become the property of her husband's estate. This included her dowry, which usually included linen and wool, a spinning wheel, a loom and a bed. This off course may vary according to the wealth of the bride's family. Husbands as a matter of course trusted their wives and allowed them to be responsible for many important things. They had to because they were often away hunting, trading or fishing for food.The woman of the house wore the keys to all the buildings tied around her waist as a sign of her authority and responsibility. She did not get a choice about whom she married though. This was in the hands of their respective families and very much an arranged matter. The remit therefore of every modern Northern Tradition couple in my view should be to drop modern day values so ingrained in society today, that is of a man having total dominance over his woman and to treat her truly as an equal in all things. Remember that Viking Age women were considered equals. There have been arguments that Viking Age men only travelled to far away places when they went e-Viking. This is not entirely correct. Women could and did play a part in this process of settlement. Iceland, for instance, was uninhabited, and a permanent population could only be established if women also made the journey there. In regions with an established indigenous population, Viking settlers may have married local women, while some far-roving Vikings picked up female companions en route, but there is evidence that Scandinavian women reached most parts of the Viking world, from Russia in the east to Newfoundland in the west. Most journeys from Scandinavia involved sea-crossings in small, open ships with no protection from the elements. Families heading for the North Atlantic colonies would also have to take all the livestock they would need to establish a new farm, and the journey cannot have been pleasant. The Viking colonists settled down to the farming life in their new home, or established themselves as traders and became town-dwellers. Both farming and trading were family businesses, and women were often left in charge when their husbands were away or dead. There is also evidence that women could make a living in commerce in the Viking Age. Merchants' scales and weights found in female graves in Scandinavia suggest an association between women and trade, while an account of a ninth-century Christian mission to Birka, a Swedish trading centre, relates the conversion of a rich widow Frideburg and her daughter Catla, who travelled to the Frisian port of Dorestad. A shieldmaiden was a woman who had chosen to fight as a warrior in Scandinavian folklore and mythology. Something about a woman who wields a sword well that so appeals to me.The Grágás or Grey Goose Law is the name given to the laws which were used to govern the Icelandic Commonwealth until some where around 1262-1264CE. It consisted of six sections, the fourth of which was “The Wergild Ring List”. Wergild, was the reparation paid by an individual to compensate a family or clan for theft, injury or death. The revision of these laws of 840CE makes various provisions, including for the payment of Wergild by Skjoldmø. The nearest translation of Skjoldmø is “Shield Girl”, but it is important that we do not confuse them with the popular fantasy figure of the “Shield Maiden” (think Opera's Brunhilde) but rather honed professional warriors, given rights, privileges and status of their own within Norse Culture. Indication of women warriors can be found in The Grágás or Grey Goose Law; the law-code of the Icelandic Commonwealth until 1262-1264 CE. More specifically, references are found in the code's fourth section; “The Wergild Ring List”. Wergild (nefgildi) was the reparation paid by an individual to compensate a family for theft, injury or death, and a revision in 840 CE makes specific mention of a class of payments by Skjoldmø. Skjoldmø (which means ‘shield-maiden from skjold + mœr) were expert professional female warriors who were afforded unique rights, privileges and status of their own within Norse Culture. At the age of about 12 years or so, The fittest and strongest girls, those who could compete in strength and speed with their male counterparts, were given the choice to become Skjoldmø, which entailed them leaving aside the traditional life of a woman and instead, to learn to take a trade and to fight. The Grágás was amended to extend to them the rights to hold a hall of their own, to be held accountable for themselves in the form of Wergild, and the right to take a husband (subject to being able to afford to keep a housewife to run their hall and to attend to her husband's domestic needs). The second presentation by Neil Price, in this case, referring to the Viking women and their links with weapons according to archaeology. According to the results found in different archaeological excavations we can see how women had a similar status to that of men . The material remains show how you can talk about the valkyria woman, that she could participate in the war . Women could divorce their husbands and were free. The conference describes very well the differences in status and roles of women in the Viking societies.